Can you spot the accidental mistake? A band of eight ladies who regularly ring at Trumpington got together specially to ring a quarter peal of Cambridge S Major, conducted by Sam, on Sunday 29th November 09. Here's to the next one! 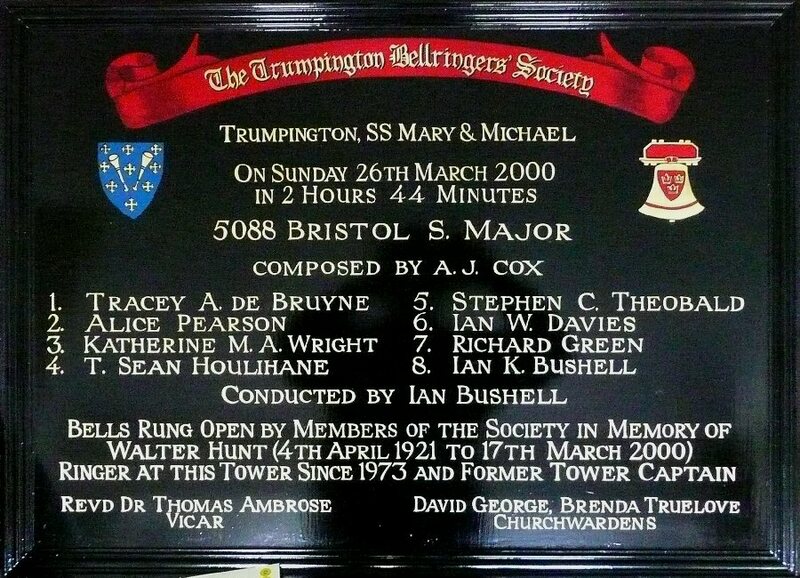 Walter ("Wally") Hunt was a loyal ringer at Trumpington for more than 25 years, and served as Tower Captain too. This memorial Peal Board was commissioned by society members and beautifully crafted by Linda Moores. To continue celebrations for his 60th birthday the previous day, Alan conducted a quarter peal of Grandsire Triples on Sunday 27th September 09. Hannah rang her first quarter peal of Cambridge Minor on Sunday 2nd August 09 - well done! Phil rang an excellent first quarter peal of Spliced S Major (4m: CYNS) on Sunday 26th July 09. Stephen called his old favourite composition (21 years old, to be precise! ), with a change of method at every lead that kept everyone on their toes. Sam & Phil are married! Sam George and Phil Gorman were married at St George's church Thriplow, Cambridgeshire on Saturday 6th June 2009. The occasion was marked with a successful peal (at Great Shelford) and three quarter peals (at Great Wilbraham, Sawston and Trumpington in the morning. Sam & Phil first met in a church porch, on Sept 1st 2006, whilst waiting to ring for a wedding at Great Shelford. Did they have an inkling then that meeting would change their lives, and nearly 3 years later, they would be ringing for their own wedding? Sam was taught to ring at Sawston by Marilyn Thompson and Stuart Abercrombie for the millennium. Sam made rapid progress in her ringing, further accelerated by her move to Guildford to study nursing and ringing with the University of Surrey Society. Phil was just 13 when he went along to St Oswald's Durham in the mid-90's to ask to learn to ring, and was taught by Kelvin Appleby, Jean Woodward and Keith Hayton. Phil continued close links with the Church, including being verger at Durham Cathedral. On arrival at St George Thriplow, guests were welcomed by the groom, the best man Owen Lindsay, and the "groom's men" (Katharine Tester, James Chilvers and Ben Willetts), all dressed in smart grey morning suits with purple cravats. Inside, the church was decorated with colour coordinated purple, white and blue flowers, arranged by Lian Watkin. The bride was 'rung-in' to the church by the groom, ushers and close friends ringing Cambridge Minor. Sam looked stunning in an ivory sequined dress, accompanied by her sisters Louise and Clare as bridesmaids, also dressed in matching purple outfits. Even Poppy the dog had a purple ribbon round her collar! The marriage service took the form of Nuptial High Mass, led by Fr. Emma Antoine, with readings by Sam's Aunty Susan, Fr. Mark Haworth and Fr. Brendan Murrill. Beautiful music was provided by organist Sebastian Smallshaw and the choir of Little St Mary's church in Cambridge, under the direction of Christian Rutherford. Canon Fr. Andrew Greany's thought-provoking sermon made reference to "bells and pomegranates around the hem of the robe" described in Exodus 28. After Sam & Phil had said their "I will"'s, some well-struck leads of Oxford TB Major were rung on handbells by Alan & Marj Winter, John Loveless and Linda Garton, whilst Sam & Phil signed the marriage register. The happy couple were rung-out of the church by those who had been involved with teaching Sam & Phil to ring and, as the bells are rung from the chancel crossing, the ringers first formed a crossed-rope archway for the new Mr & Mrs Gorman to walk through before heading back down the aisle to be met at the porch by a throng of awaiting Brownies from Sam's Brownie Pack. Sam & Phil then returned up the aisle with applause to ring the same Cambridge Minor, but this time with Sam and Phil coursing each other on 2 & 4. Official photos were taken by Rhyan Probert throughout the day, including at Thriplow where he climbed to the roof of the church to take group photos looking down on all the guests, scrambling over gargoyles and church masonary in his path. Several touches were rung by ringing friends whilst photos were being taken - Poppy the dog even tried to take part, but thankfully avoided the ropes. The reception was held at Foxton Village Hall. Sam & Phil were keen to make the day inclusive for all, so chose a 'Bring and Share' catering in the style of a ringer's tea. Jackie Latham, and her army of helpers from the Cambridge District, did a wonderful job of handling the reception catering. The quantity of sumptuous food was overwhelming. Ian & Pam Davies looked after the bar, complete with beer from the Milton brewery and a custom "IWD Arms" pub sign made by Sam's sister Clare. Our MC Edward Simpson introduced the entertaining speeches by the Bride's Father (Jim), the Groom and the Best Man. Phil described how he had proposed to Sam in a rather romantic location - a cold station platform in Grosmont, Yorkshire, following dinner on the NYMR Pullman! He especially thanked his mum Linda, and Sam's parents Alison & Jim for their support over the years and in the lead-up to this occasion, and all the helpers who had contributed their time and skills to this special day. Phil concluded by offering a 'gastric wash-out' by the many A&E staff present to any guests who were overindulgent with the alcohol during the reception! The wonderful triple decker cake, made by Sam's parents Alison & Jim, iced by Hazel Bull, and adorned with purple ribbons and balloons, was cut by Sam & Phil with Lt Oliver Pearson's ceremonial sword. Formalities over, our entertainment continued late into the evening with a disco (lots of 80's tracks! ), coin-rolling sweepstake in aid of Sam's Brownies, and as much food as you could eat, finishing with final farewell's to Sam & Phil as they departed for their honeymoon in Croatia. We wish them much happiness in their future lives together - well and truly spliced ! What better way for Sam & Phil (with connections to Guildford & Durham respectively) to prepare for their wedding than to ring a Quarter Peal of these two tricky Delight methods spliced! Thanks to Alan for providing this challenging opportunity and to Robert for producing a suitable composition and conducting the quarter on 24th May 09. After ringing for morning service on Sunday 10th May 09. Paul Flavell's 5-part composition of the standard 8 spliced kept us on our toes for the QP on Sunday 26th April 09. This was Marj's first of 8-Spliced and Mark's first Spliced as conductor - congratulations! The last QP of Glasgow was nearly two months ago, so Chris and Adrial joined us for a Glasgow refresher on Sunday 29th March 09. The local band scored an excellent Quarter Peal of Glasgow on Sunday 1st February 09 - Sharon & Marj's first of Glasgow S Major. The local band rang a Date Touch of 2009 changes of (mostly) Yorkshire on 1st January 2009 to welcome the New Year. The composition, based on Middleton's with some interesting 'bump' calls to give the right number of changes, was composed and conducted by Alan Winter.